Former First Lady Rosalynn Carter has been a driving force in the field of mental health throughout her public service career. She was a member of the Governor's Commission to Improve Services to the Mentally and Emotionally Handicapped when her husband was governor of Georgia. As active honorary chair of the President's Commission on Mental Health during President Carter's administration, she helped bring about passage of the Mental Health Systems Act of 1980. Today, she continues her leadership through The Carter Center in Atlanta. Founded by President and Mrs. Carter in 1982, the center is dedicated to improving the quality of life for people at home and in the developing world through programs in peace and health. In 1985, she initiated the Rosalynn Carter Symposium on Mental Health Policy to bring together representatives of mental health organizations nationwide to focus and coordinate their efforts on key issues. For 32 years, annual symposia held at The Carter Center investigated such topics as mental illnesses and the elderly, child and adolescent illnesses, family coping, financing mental health services and research, treating mental illnesses in the primary care setting, and stigma and mental illnesses. 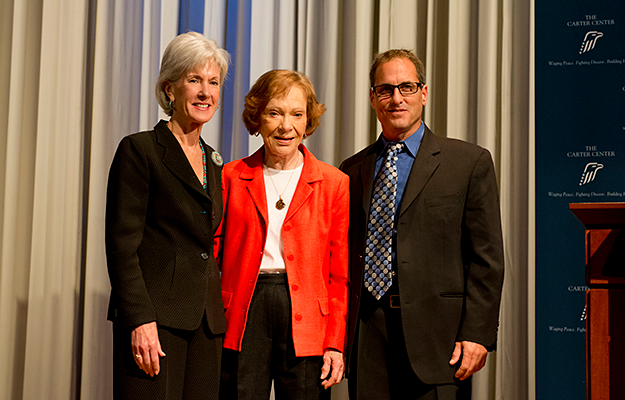 On Nov. 8, 2013, Health and Human Services Secretary Kathleen Sebelius (left), former First Lady Rosalynn Carter (center), and David Wellstone (right), son of the late Senator Paul Wellstone, celebrated the release of final regulations on mental health parity during the 29th Annual Rosalynn Carter Symposium on Mental Health Policy held at The Carter Center in Atlanta. The Carter Center Mental Health Task Force, chaired by Mrs. Carter and composed of individuals in a position to affect public policy, meets quarterly to identify policy initiatives and set the agenda for The Carter Center Mental Health Program and annual symposia. Program staff work year round to sustain the momentum of the symposia and to unify professionals in various mental health disciplines. 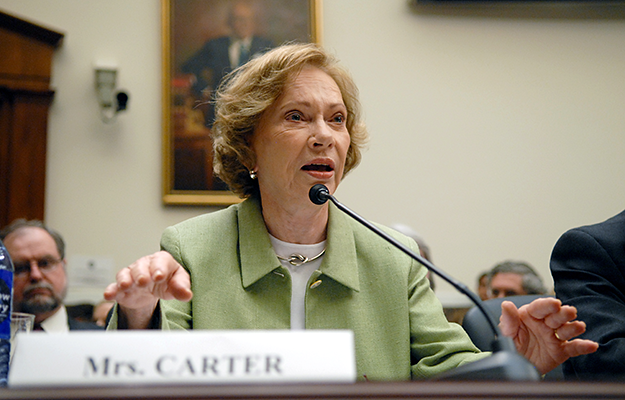 With the inception of the Rosalynn Carter Fellowships for Mental Health Journalism in 1996, Mrs. Carter launched one of the most successful international programs in combating the stigma associated with mental illnesses. 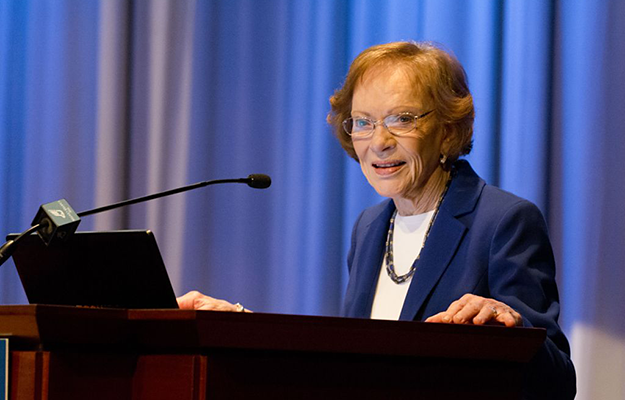 Through the Rosalynn Carter Institute for Caregiving (RCI), established in her honor at her alma mater, Georgia Southwestern State University in Americus, Ga., Mrs. Carter addresses the concerns of those who take care of people suffering from mental illnesses and other chronic illnesses and long-term disabilities. Through research, education, and training, the RCI promotes the mental health and well-being of individuals, families, and professional caregivers; delineates effective caregiving practices; builds public awareness of caregiving needs; and advances public and social policies that enhance caring communities. Both professional and family caregivers benefit from RCI programs to improve coping skills and foster greater emotional and physical well-being. As a result of research conducted at the RCI, Mrs. Carter published in 1994 Helping Yourself Help Others: A Book for Caregivers co-authored with Susan Golant. Rosalynn Carter has led the fight against the stigma of mental illness for more than 45 years. Through statewide and international symposia, Mrs. Carter has empowered mental health professionals and consumers. Following on the success of her caregiving book, Mrs. Carter teamed up again with Susan Golant in 1998 to write Helping Someone with Mental Illness: A Compassionate Guide for Family, Friends, and Caregivers. Building on her decades of experience in the field, Mrs. Carter discussed the latest treatments and research generated from her symposia and in consultation with the major mental health organizations in the United States. She also addressed how best to help those with illnesses such as depression, schizophrenia, bipolar disorder, anxiety attacks, and obsessive-compulsive disorders by being an effective, compassionate caregiver and advocate. Helping Someone with Mental Illness was selected as the winner of the 1999 American Society of Journalists and Authors Outstanding Book Award in the service category. In May 2010, Mrs. Carter issued a call to action for creating equity for mental illnesses in our health care system by publishing Within Our Reach: Ending the Mental Health Crisis (with Susan Golant and Kathryn Cade), a deeply personal account of her advocacy and an unsparing assessment of the state of mental health care. Using stories from consumers and professionals she has met over the years, Mrs. Carter crafted an intimate account of a subject previously shrouded in stigma and shadow, surveying the dimensions of an issue that has affected us all. She described a system that continues to fail those in need, even though recent scientific breakthroughs with mental illnesses have potential to help most people lead full and productive lives. 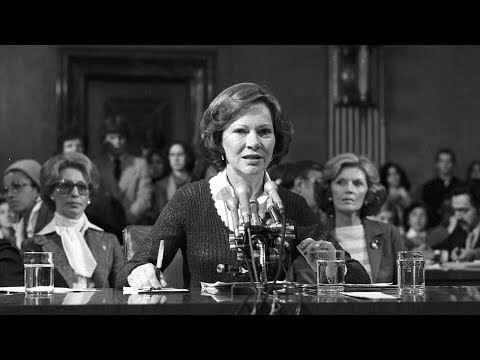 Watch an overview of the Center's Mental Health Program and the advocacy of former First Lady Rosalynn Carter.